Today, on planet earth there are approximately 3500 species of grasses both on land and underwater. We interact with many of these every day, whether we eat them, use them in everyday objects, see them outside or swim over them during a dive. Seagrasses are the only flowering plant underwater and of the approximate 58 species of seagrass that are known, 4 are found in the UK and her surrounding waters. Around the UK seagrasses are commonly found in small inlets, sheltered waters, estuaries and saltwater lagoons. Seagrasses are mostly found in shallow waters as they need to be within reach of sunlight in order to photosynthesise. A handful of seagrasses, such as the common eel grass, may be found below the low water mark (the level reached by the sea at low tide); this adaption reduces its likelihood of being feasted on by wildfowl. The growth of seagrasses is very interesting: they have horizontal stems, running across the seafloor or the surface of the water, with dark green, long and narrow leaves extending from this. The roots are often buried in the muddy, sandy or gravel bottom, their roots stabilise the seabed and effectively reduce erosion of the land. In most flowers on land the cell division occurs in the tip of a leaf however in most grasses such as those on your lawn at home, or the wonderful seagrasses underwater, cell division occurs in the base of the leaf rather than in the tip. This allows for continued growth of the grass even after it has been damaged, mowed down, or eaten by a turtle. Seagrasses are vital to the oceans for many reasons: they form thick and dense meadows which effectively slow down water currents, allowing nutrients to settle and attracting wildlife; they act as breeding grounds as well as feeding grounds; and produce vast quantities of the oxygen we breathe. Seagrass is a major habitat for many different species around the world: from shrimps, rays and crabs to cephalopods, flatfish, pipefish and seahorses, many worms and echinoderms also live here. The leaves of the seagrass are colonised by algae, stalked jellyfish and various anemones. The young of many animals thrive in the seagrass, within the shelter and away from predators. Without this protection, many wouldn't survive. Seagrasses are also vital to the diet of many marine grazers such as turtles, dugongs and manatees. Dugongs and manatees are some of the few marine mammals which have evolved from land animals. Their skulls are highly evolved for taking in air and they are highly adapted to be grazers; a small herd can eat up to a football pitch worth of seagrass every day. Turtles in comparison are more careful feeders: first eating the tops of the leaves of the seagrasses, these are usually tougher and older; and then they will move onto eating the base of the leaves, nearer the growing point. Turtles have a habit of coming back and grazing over the same spot again and again. Many wildfowl also benefit from the seagrasses feeding on the intertidal beds or the exposed grass at low tide. Seagrasses offer vital nutrients to the animal communities and are one of the most valuable ecosystems as they sustain the marine food chain. Seagrasses are also vital as in the marine ecosystem because they soak up excess nitrogen and phosphorus in the water which have ended up there due to fertilisers, however there is a limit to how much they can soak up. 1. The nutrients become toxic to the seagrasses. 2. The organisms that are attached on to the seagrasses are photosynthetic and will be stimulated to grow bigger due to the high levels of nutrients. 3. Phytoplankton within the water is stimulated to bloom with an increase of nutrients, this results in lower amounts of light reaching seagrasses and lower oxygen levels in the water. This reduces the seagrass' ability to photosynthesise and grow. 4. These phytoplankton release toxins, if they are stimulated to bloom then huge quantities of toxins will be produced, and released - resulting in a mass mortality of not only seagrasses, but marine life in general. Competition is also a large concern for seagrasses. Many species of plant have been introduced by humans which are able to outcompete seagrasses, one such example is seaweeds. Seaweeds have a much higher tolerance to overabundance of nutrients than seagrasses, and therefore they are aiding the rapid decrease of seagrass populations. Human powerboats and bottom-fishing gear rip out seagrasses. Dredging and coastal development not only stirs up silt which smothers seagrasses but also decreases the area where they can grow. Many seagrass populations have now been enlisted as endangered. The huge decline of seagrasses doesn't just affect seagrasses, but it also has a huge impact on all the species which live within them and us land faring animals as well. Seagrasses are hugely important habitats, approximately 1m2 of sea grass produces 10l of oxygen per day and with close to 177,000km2 of seagrass in the ocean, a lot of oxygen that you and I breathe is produced thanks to these very seagrasses. Seagrasses cover only 0.2% of the ocean surface area but contain 15% of the total ocean carbon store. Per 10,000m2, seagrasses hold twice as much carbon dioxide as rainforests do and consequently when seagrasses are destroyed they release considerably more carbon dioxide than rainforests do. Seagrasses are currently suffering an estimated 7% decline annually. With 30,000km2 lost in just the past few decades (equating to 18% of the whole global area of seagrasses). The rate of loss is approximately 2 football fields a day. Seagrasses are now considered the most threatened ecosystem worldwide. Historically, the British Isles have lost at least 50% of the seagrass habitats due to a widespread disease during the 1920s and 30s. Seagrasses are variably slow to recover and their steady recovery has been further hampered by humans. Some areas around British waters have 75% more nitrogen than the global average, causing most of the seagrasses around the British Isles to now be in a perilous state. Governments around the globe are starting to take action in order to protect seagrasses. European Habitats Directive have listed seagrasses as "strictly protected". The Marine and Coastal Access Act of 2009 created 4 marine conservation zones around the UK and her waters. Additional work is being done in marine areas in Scotland and Wales whilst Northern Ireland are still legislating for further work to be done. Governments are limiting the speed of boats around seagrass meadows, and restricting coastal development and pollution in the sea in order to prevent seagrasses from being overwhelmed with sediment and toxic nutrients. In certain areas dredging or anchorage is no longer allowed. As the awareness of seagrass and its importance grows, governments are taking more and more action globally to help sustain seagrass populations. 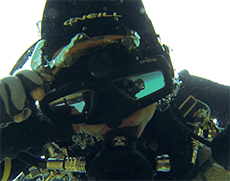 So, the question I can hear you all shouting out is "what can I, as a diver, do to help?" Seagrasses are almost as delicate as coral, and are certainly as important, so you should treat them as you would corals. 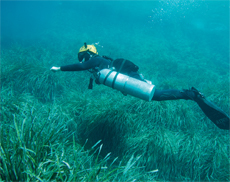 On numerous occasions I have seen divers standing or kneeling within the seagrasses, seriously damaging them and impeding them from growing back. So the best thing you as a diver or a snorkeler is to respect the seagrasses; take care with your fins so you don't cover the seagrasses in sediment and also share the seagrass love! If every diver is a little more aware of their surroundings and how important seagrasses are then together we can help reduce the decline of seagrass populations. Having dived in various different countries I have come across many fields and meadows of seagrasses and I have always taken them for granted. I would usually sigh that we were coming across yet more seagrass on our dives yet at the same time I was fearful of what unknown fish were lurking beneath me as we swam over them! After having researched seagrasses, their benefits and their unfortunate decline I have come to appreciate them and their importance so much more. I will no longer view them as a bore on future dives, but something that has sparked my interest, something that everyone, divers and non-divers rely on every day and something that we must protect from future decline or extinction... although I may still be a little scared to swim over the longer stuff...!